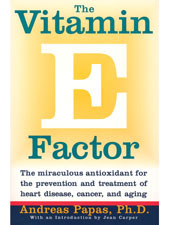 Andreas Papas, Ph.D. - The Vitamin E Factor by Andreas Papas, Ph.D.
Home / Books / By Author / Andreas Papas, Ph.D. / The Vitamin E Factor by Andreas Papas, Ph.D.
Enlarge Image Email to a Friend The Vitamin E Factor by Andreas Papas, Ph.D.
*Prevent heart attacks, some cancers and cataracts. *Delay the onset of and Alzheimer�s disease. *Reduce the risk of complications from diabetes and AIDS. *Slow down the aging process. *Maintain good health and improve the quality of life. Even more important, this book explains why most commercial vitamin E products do not provide the full benefits because they contain only one of the eight members of the vitamin E family. You will be introduced to the long-ignored other tocopherols and the tocotrienols and their benefits. You will learn how to develop a customized personal plan to enjoy the full benefits of the whole vitamin E team. This amazing team is an indispensable partner for good health and quality of life: vitamin E can help improve poor fertility of men, help mothers have healthy babies, and reduce the misery of arthritis, premenstrual syndrome (PMS) and menopause. Part VII - What Does The Future Hold? About the Author: Andreas M. Papas, Ph.D., is a senior technical associate at Eastman Chemical Company and adjunct professor at the James Quillen College of Medicine at East Tennessee State University. He has extensive experience in antioxidant and vitamin E research and has edited the widely acclaimed scientific book Antioxidant Status, Diet, Nutrition, and Health.